A long-haul flight is much more than simply a means of getting from A to B. With so many hours in the air, it’s a huge part of your trip. Therefore, it’s important to know you’ll be comfortable for the entire length of your journey, have everything you need to hand and be well looked after, whatever your needs while on board. And, thanks to its award-winning service and it’s fantastic added value extras, Singapore Airlines goes further than other airlines to ensure your long-haul experience is an enjoyable one. to a huge 50kg in first class. an International Culinary Panel — a team of eight celebrated chefs from around the world. The airline employs skilled sommeliers to select the finest vintages and to test them out under cabin pressure. In addition, the airline provides passengers with an extensive drinks service, which includes cocktails such as the world-famous Singapore Sling. One of the best ways to pass the time on a long-haul flight is to kick back with a movie or a TV show. Singapore Airlines provides every passenger with a personal video monitor and handheld control unit, enabling him or her to enjoy KrisWorld, the airline’s award-winning in-flight entertainment system. KrisWorld offers up to 285 movies, more than 470 TV programmes and in excess of 450 music albums each month. It’s not always easy to stay fresh on a flight — especially a long-haul one. Thankfully, Singapore Airlines has thought about this. The airline has introduced its own brand of on-board amenities including individual toothbrush, toothpaste and knitted sock packs, while offering mouthwash, skin moisturiser, cologne and aftershave lotions in the lavatories. 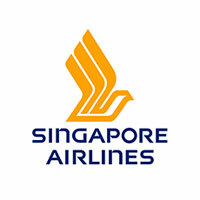 One of Singapore Airlines’ greatest assets is its base of Singapore. The island country is one of the most fascinating destinations in Asia, with intriguing culture, great food and a host of must-visit sights and attractions to explore. That’s why Singapore Airlines offers all passengers with a transit time at the airport of six hours or more a free city sights tour. However, the country is also a fantastic place for a stopover break, which is something Singapore Airlines tries to encourage, with great discounts on restaurants and accommodation. Its Singapore Stopover Holiday packages also come with free rides on the open-top, hop-on and hop-off buses that run along the city’s sightseeing routes. Thanks to its array of shops, restaurants and other diversions such as a massage area, themed gardens and a movie theatre, Singapore’s Changi Airport is a real pleasure to transit through. Passengers flying on Singapore Airlines earn a voucher worth $20 each, which can be used for retail, food and service outlets, as well as to purchase duty free goods. For more Singapore Airlines destinations, read the travel section of The Evening Standard and The Independent. A version of this article first appeared on standard.co.uk and independent.co.uk.